Roelandt Savery was born in 1576 in Courtrai, Flanders, into a Mennonite family of painters. Following the Spanish occupation he moved to Bruges in 1580 then to Haarlem around 1585. According to Van Mander, Savery trained with his brother, the painter Jacob Savery, and the two artists moved to Amsterdam in 1591. After his brother’s death Savery moved to Prague where he is documented in 1604. He worked there as court painter, firstly for Rudolf II, then from 1612 for his successor the Emperor Matthias. 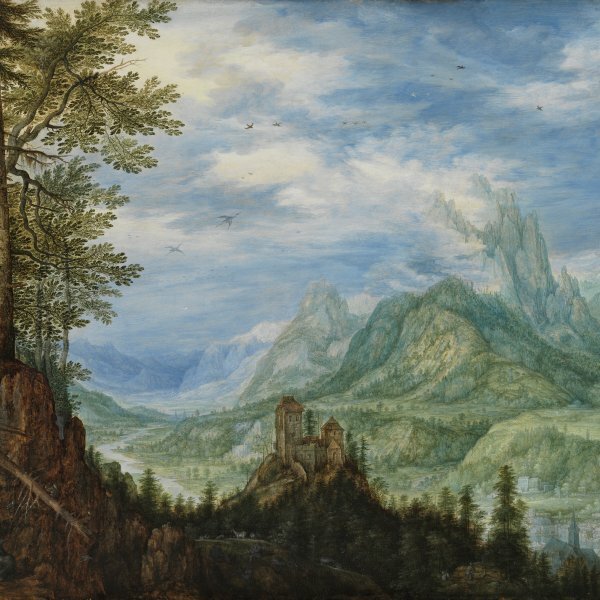 Between 1606 and 1608 he travelled on the Emperor’s instructions to the Tyrol where he made numerous topographical drawings. It is known that while in Prague Savery maintained close contacts with other northern painters such as Bartolomeus Spranger and Hans van Aachen. After a brief period in Amsterdam and Haarlem, Savery permanently settled in Utrecht in 1616 and appears in the records of the painters’ guild. His nephew Hans Savery II, who had also been in Prague, moved with him and became his principal assistant. In 1621 Savery bought a large medieval house on the Boterstraat which became the meeting place for the Utrecht artists, particularly painters such as Balthasar van der Ast and the Bosschaerts, attracted by Savery’s spectacular flower garden. Economic problems led to his bankruptcy in 1638 and many of his properties were confiscated. Financial issues and mental health problems affected the last years of his life. Savery died in Utrecht in February 1639 and his nephew Hans Savery II took over his studio. Savery’s paintings, which are clearly influenced by the style of his brother Jacob Savery and by his contacts with the Prague court artists, encompass a variety of genres including floral and other still lifes, scenes of everyday life and customs, landscapes and paintings of animals.